Here are some fun printables with a Scottie dog theme! We've got writing frames to use in the classroom, Scottie sorting printables (for sorting by size and colour) and some lovely bright Scottie colour posters (which can also be cut out and used for display, to make a colour book or as lacing cards). Younger children can have fun colouring in this Scottie outline - blue. Here's a colouring page for the colour orange - with a fun outline of a Scottie to colour! Grab a pink crayon and colour in our Scottie - perfect for little ones learning their colours! Help children learn their colours with our fun Scottie colouring page. Purple is required for this one! 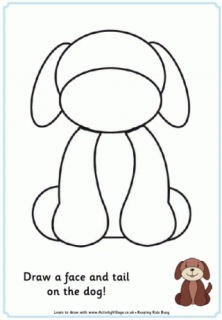 Have some fun with this extra-simple "red" colouring page for younger children with our lovely Scottie outline.